Inspire your class with a hands-on session designed to engage pupils with the natural world, develop their communication and social skills, and enrich their learning. Navigate your way around the habitats of Wild Place Project using simple orienteering skills to find and complete team challenges! Kick off the academic year on the right foot, with a series of teambuilding challenges for your group that will help develop positive relationships, build social and communication skills and grow confidence! For the ultimate challenge why not add on a Leap of Faith session? 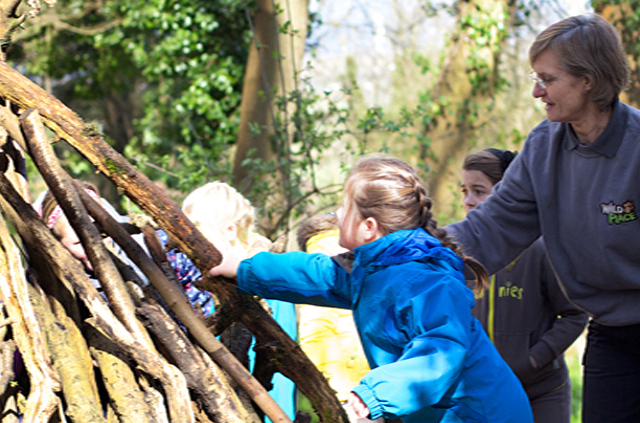 Explore our new Forest Camp and take part in a variety of activities designed to develop self-esteem, teamwork and physical skills. Activities can tie into literacy using books and fairytales you’re reading in school, promote team building, explore the senses, or try out simple survival skills… just let us know your objectives! Also available as a double-length session. Choose between pond-dipping in our Victorian pond or exploring our woods and meadows. Examine weird and wonderful minibeasts up-close using magnifiers, learn about their adaptations and identify them using a simple key. Also available as a double-length session to compare and contrast different habitats. Available April-July. Pupils discover the many uses of plants, identify woodland plants, examine a flower under a field microscope and explore pollination and seed dispersal. They also plant seasonal seeds or bulbs to take home. Available April-July. Evolution comes to life through games and hands-on activities. Using our giraffes as a case study, pupils learn about adaptation and natural selection and discover how they lead to evolution. Pupils explore colours, patterns and textures in nature, and are inspired by the forest around them to create natural artworks and decorations. They learn to identify trees and plants, and develop literacy skills by gathering exciting words to describe their sensory experience. Introducing classification with an engaging detective hunt exploring the features of different vertebrates. Pupils also sort animal artefacts, play topical games and meet some live invertebrates. In our Madagascan village, pupils discover the unique species of the world’s fourth-largest island and play the deforestation game. They solve clues in an interactive trail and meet a Madagascan creepy crawly. One of our most popular sessions! Challenging preconceptions of the Big Bad Wolf, pupils discover why wolves howl and find their pack by smell alone. Through a series of games, pupils learn about wolf adaptation and take part in the predator-prey challenge. Get festive at Wild Place this winter and find out why reindeer are associated with Christmas, how they are adapted to survive the cold, and make your own reindeer Christmas decoration to take home. These sessions can also be adapted for EYFS sessions. For more information or to book please email email info@wildplace.org.uk or call 0117 428 5602.